Abstract The process which this equipment “Copper Terminator” uptaking Cu2+ is modeled by ordinary differential equations. Parameters in this models are both inferred from our experiments or obtained from literature. Second order Runge-Kutta method is utilized in simulation and the result shows that Cu2+ is almost entirely eliminated within 300 minutes from 1mg/L. 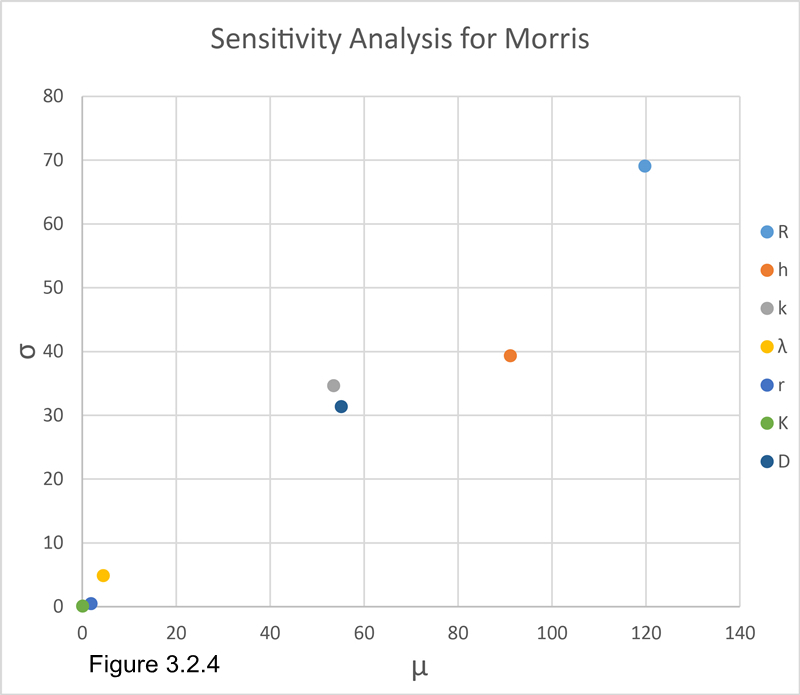 Finally, Morris sensitivity analysis is carried out and shows that four controllable parameters are most important to the effect of elimination and this demonstrate the possibility of its application. In our “Copper Terminator” (Figure 3.2.1), E.coli reproduce in a relatively stable environment in which the temperature is set constant by a temperature sensor , a heater and a microcontroller. 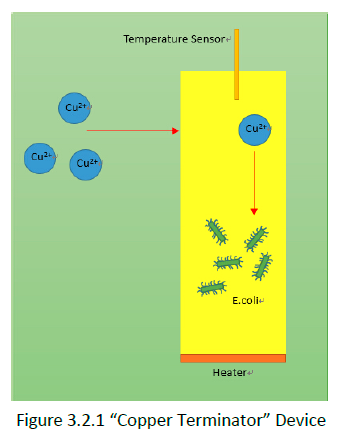 Polymers are covered on a framework to keep E.coli form spreading into outside space but let Cu2+ pass through. Cu2+ which have entered this equipment is uptaken by E.coli. Due to our experiment, Cu2+ concentration have little influence on the growth of E.coli. The critical values of tolerance of Cu2+ for DH5α and BL21 is 165mg/L and 160mg/L which are all beyond the normal concentration in water. We assume that the growth of E.coli is not influenced by Cu2+ concentration. Since we have polymers covering the surface of this equipment, the environment inside is relatively independent from the environment outside. The growth of E.coli can hardly be disturbed by environment outside. The assumption is that the growth of E.coli is subject to logistic model, in other words, the environmental resistance only comes from the competition on nutrition within the population. How Cu2+ is transported into E.coli is still undiscovered. So that it is difficult to come up with an exact description by mathematical equations for this process. To simplify this model, we assume that the rate of Cu2+ uptaken is not related to the physiological status of E.coli. They are equal under different stage of a single E.coli. For this model here, we assume uniformity of Cu2+ and E.coli. in the solution. Parameter k here has a different unit from previous ones. Simulation is carried out by second order Runge-Kutta method with a step of 0.1 min and 3000 times iteration. The parameters are both from our experiment and some literatures. Figure 3.2.2 shows the Cu2+ concentration change with time both inside and outside. Figure 3.2.3 shows the growth curve of E.coli. Global sensitivity analysis is a method to analyse all the parameters at one time to find out the influence on the result for each parameter and the interaction between those parameters. Morris (1991) proposed conducting individually randomized experiments that evaluate the effect of changing one parameter at a time. Each input may assume a discrete number of values, called levels, that are selected from within an allocated range of variation for the parameter. For each parameter, two sensitivity measures are proposed by Morris (1991): (1) the mean, μ, which estimates the overall effect of the parameter on a given output; and (2) the. Standard deviation of the effect, σ, which estimates the higher-order characteristics of the parameter (such as curvatures and interactions). We define t0.5 as the time when Cu2+ concentration outside reaches 0.5mg/L, which is the maximum value allowed in city water. Monte Carlo method is applied to generate 80 groups of 7 parameters randomly with certain distributions. t0.5 of each sample can be calculated and then they are undergoing Morris sensitivity analysis. According to figure 3.2.4, the most significant parameters which have most effect on the result in this model are R, h, D, and k. Those parameters are all controllable parameters. The result of Morris analysis gives us a direction on design and application of these “Copper Terminator” equipment: As long as we set proper R, h, D, and k, we will make an outstanding improvement on the performance. Keen, Robert E., and James D. Spain. Computer simulation in biology: a BASIC introduction. John Wiley & Sons, Inc., 1994. Morris, Max D. "Factorial sampling plans for preliminary computational experiments." Technometrics 33.2 (1991): 161-174.